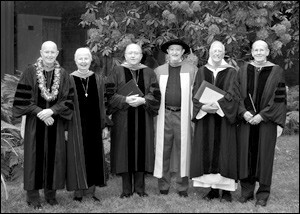 Church Divinity School of the Pacific 2006 honorary degree recipients with Acting Dean John Kater (third from right). (CDSP photo for ENS) Additionally, honorary Doctor of Divinity degrees were conferred upon the Rev. Roger Alling, former president, Episcopal Preaching Foundation, Inc., from Camp Hill, PA; the Rev. John Barton Sarjeant ’65, former Rector, St. John’s Episcopal Church, Ross, CA; and the Rev. Thomas H. Schultz, O.H.C. (Order of the Holy Cross), Prior, Incarnation Priory, Berkeley, CA. Dr. A. Gary Shilling, Chairman, Episcopal Preaching Foundation, Inc., from Springfield, NJ, received the honorary degree of Doctor of Humane Letters. In this morning’s story a man born blind meets an extraordinary healer who describes himself as the light of the world. In an act of compassion, grace, and healing, the blind man sees for the first time in his life. One might have thought that this would be the end of the story. It is, however, only the beginning. As soon as this man is restored to physical health; he finds that he is in trouble with his community, his family, and his clergy. Those who were close to him during his blindness, now distance themselves from him when he is healed. The Pharisees are skeptical and offended because Jesus has done this on the Sabbath and is a sinner. Even the man’s parents evade questions out of fear of the religious officials. Throughout this ceaseless round of questions, the healed man remains constant. Because of this, he is eventually shunned by his community and driven out of his synagogue. Here we have a man born blind being brought to sight and insight. Then we have allegedly wise Pharisees slipping into blindness and error as a new truth emerges which is too great for them to handle. What’s more, the blindness and error is perpetrated by those very officials and institutions that we look to for guidance, help and insight. What can we make of this story? What relevance might it have for us today? This story is an instance of religion and religious ideas gone astray. When that happens, the effects are often horrendous. 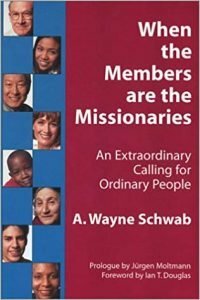 The philosopher George Santayana once wrote that, “The worst, is but the corruption of the best.” This certainly seems to be true when religious ideas and institutions are misdirected or corrupted. You remember the Cold War. It went on for years and was announced to be over with events like the breakup of the Soviet Union and the demolition of the Berlin Wall. People began to talk about a new era of peace and harmony. Have we had that, or was that but a fond hope? Just think about some of the headlines we have read in all the years since the end of the Cold War. Go all the way back to the civil war in Bosnia and Herzegovina: Then, Eastern Orthodox Christian Serbs were warring against Bosnian Muslims. The slaughter was tremendous and unusually cruel. Move farther east. One of the oldest Christian Churches in the world is the Coptic Church in Egypt. For years the Copts have been directly persecuted by the Muslim majority in that country. This violence is not just in the Christian west. Hindus and Muslims have feuded in India for generations. Their skirmishes cause the deaths of thousands of people. Some of these religiously based acts of violence are between two kinds of Christians. Think of the decades of violence, hatred and murder in Northern Ireland. Unfortunately, we are now hearing that this Catholic Protestant dispute is rearing its ugly head once more. We all know what happened on 9-11 in New York City and who was responsible – A religious extremist and his followers are linked to the terrorist bombing of the World Trade Center and the deaths of nearly 3,000 of our citizens. In response to that tragedy, some in our country have done violence to innocent Arab Americans who had nothing to do with the bombing. I am sure you remember Billy Graham’s son Franklin’s unhelpful statement that “Islam is a satanic religion.” Statements like this do not make religion a stepping stone to peace! There is something very wrong with all of this. We seem to be getting the worst behaviors from those who are supposed to be the best and godliest people. It is as though religion itself has become corrupt, poisonous and immoral. Designed to be a grace and help to the human condition, religion now seems to deepen hatreds and increase disruption. There is a necessary conservative impulse in all religions and all religious institutions. This is because religions by their very nature are designed to preserve and hand on to the future something of great importance from the past. These same religions typically run into trouble when they must adjust and accommodate to some new truth or new insight or new revelation. It seems always easier for religions to be open to their past than they are to be open to the future and to change. This was true in the ancient world when Christianity began, true again during the Reformation and Renaissance four hundred years ago and it is true today in our nation and around the world. The media are fond of lumping together extreme religious reactions and calling them all “fundamentalists”. This is a misuse of the term. Fundamentalism was a term coined at the turn of the 20th century by Christians in America who insisted on the importance of a number of central doctrines. They feared these teachings would be lost in the new confrontation and dialogue with natural science. Words that far better express the gross religious errors of our time are fanaticism and extremism. I call fanaticism “over believing” and extremism “undisciplined commitment”. Fanaticism arises when believers suffer from overconfidence in their own beliefs and prejudices. Fanatics become so absorbed in their own ideas that they become isolated from everyone else. Before long people who do not share their ideas are seen as enemies and agents of evil. That is when fanaticism becomes extremism as the commitment of the true believers turns to violence and bloodshed against the infidels. When religions around the world, and even in our own country, become fanatical and extremist, those of us who wish to remain persons of faith are challenged. Fanaticism and religious extremism give the practice of religious life a tarnished reputation. How can we practice our faith in an orderly, open and reasonable way? What do we mean by faith and living by faith? The word faith means trust, or confidence. Faith is not so much a certainty of the mind as it is an assurance of the heart. This faith or trust requires courage and comes without guarantees. In Judaism and Christianity, faith is contrasted with certainty and knowledge. Abraham is called to journey in faith from his home to an unseen promised land. Likewise, St. Paul never thought we would see clearly and completely during our earthly walk of faith, but only dimly as through a mirror. Now there is another kind of faith abroad in the land and in the world which I would contrast with the objective faith in God. I call it subjective faith in one’s own faith. It is not trust in God or God’s goodness; it is trust in one’s belief in God rather than trust in God alone. This is the kind of faith that I am worried about. This is the kind of faith that can breed the sort of trouble that infects our world today. Faith in one’s faith is the elevation and worship of one’s own ideas. It is substituting one’s partial grasp of God for God’s unlimited and complete grasp of the world. Faith in one’s own faith is an ideology and idolatry of one’s own making. “Faith in one’s own faith” is no substitute for a lively trust in the living God. This new version of faith is divisive and separates us from one another and that has grave consequences for our society at large. Our nation was built on the assumption that citizens could have legitimate differences and they would be respected. Fanatics and extremists are effectively cutting away at two great historic strengths of our society: our pluralism and our diversity. The time has come for those of us who speak up for rationality in religion to claim these traditions once more before all civility in religion and politics is lost entirely. Looking back to the man Jesus healed in today’s Gospel we can but hope that eventually he was able to find a synagogue that would accept him and a neighborhood that would rejoice in his healing.